Kristen Green set out to understand what happened in the place she grew up – Prince Edward County, Virginia – between 1959 and 1964, when the county closed every single one of its public schools instead of integrating under court order. 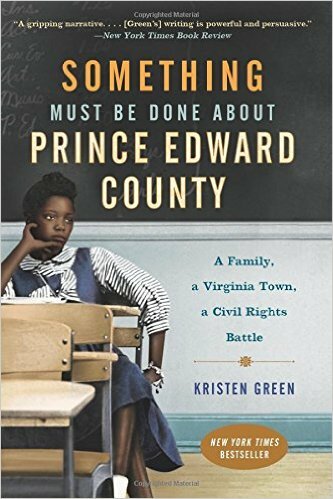 ‘Something Must Be Done About Prince Edward County’: A Family, a Virginia Town, a Civil Rights Battle is a mash-up of history and memoir chronicling what Kristen learned about her hometown community, including – painfully and personally – those closest to her. The New York Times and Washington Post both praised Something Must Be Done in favorable reviews, though other reviewers have been a touch less generous not about the story it tells but the manner in which it is told. “Something doesn’t always flow easily,” writes Entertainment Weekly. The Guardian concurs (“In prose that is not always as lively as the story she tells, Green chronicles her own family’s complicity in their local battles.”) That being said, Something Must Be Done was a New York Times bestseller in race and civil rights and in education, and it was longlisted for the Andrew Carnegie Medal for Excellence in Nonfiction. Sounds fascinating– just the kind of social history I love. Wish I were in Nashville to hear her speak! Lived in the joining county at the time,Nottaway,and knew the lawyer , Segar Gravitt,who defended Prince Edward and he was a distinguished UVA graduate and brilliant attorney. Nottoway combined three high schools; Luther Foster, Nottoway High, and Crew High. Three distinct groups which had nothing in common. Was quite a struggle as some of the teachers were not qualified. Nevertheless we prodded on and succeeded despite of the circumstances. We were one of the few Caucasian families that sent our high school age children to the new integrated high school. A new segregated school was established immediately in Nottoway and is still in existence. Our oldest daughter spent one year in the new Nottoway and went on to UVA early. Second daughter had a tumultuous year as president of the student body ,and went on to graduate from the new Nottoway. She recently retired in Virginia as an MD. Older daughter a prominent attorney in Nashville with Bass-Berry. It was indeed a tragedy for Prince Edward. It was indeed a tumultuous time in all of Southside Va..My wife is a graduate of Longwood and was the librarian at the new Nottoway High. Your father-in-law is a classmate of my Wife’s at GHS and a dear friend of ours. We grew up in Gallatin and share many of the same memories. I was a Captain during the Korean war but fortunately never got further than Arizona. Bill certainly has multiple gifts in the arts, an excellent writer in addition to being an artist. Small town Gallatin( 3,500 in the late 30’s) was such a wonderful place to spend our formative years. We have one grandson in a Nashville magnet school. Was in Ensworth but transferred two years ago. I hope to attend the event at VB. I lived in Farmville (Prince Edward County), VA, for my early elementary years and have read Kristen’s book.